Bradford City scored two goals in as many minutes to pile more misery on League One bottom club Crewe. 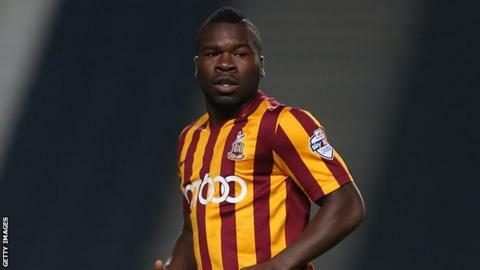 The Bantams had gone four home league games without a win. But Aaron McLean gave City the lead in the 72nd minute with a header from Mark Yeates' cross, before Gary Liddle struck the second from outside the area after Filipe Morais' pull-back. Crewe, for whom Chris Atkinson went close, have taken only four points from 11 games, conceding 29 goals. Crewe boss Steve Davis withdrew on-loan Swansea City centre-half Alan Tate at half-time, replacing him with on-loan striker Febian Brandy in a tactical reshuffle. "Taking Alan Tate off was purely tactical. We felt we had enough out there to keep them out. That doesn't mean to say he won't be involved against Coventry this weekend. "We found it difficult in the first half to get out and push them back and that is why we changed the formation. "For 70-odd minutes we had defended reasonably well and it looked as though they were running out a bit but the centre-halves didn't quite sort out the marking and McLean has got between them to score. "We kept trying to give the lads the best chance to keep things tight and give ourselves a chance. The players worked extremely hard and it was just those little errors that have cost us." Match ends, Bradford City 2, Crewe Alexandra 0. Second Half ends, Bradford City 2, Crewe Alexandra 0. Foul by Oliver McBurnie (Bradford City). Attempt saved. Mark Yeates (Bradford City) right footed shot from outside the box is saved in the top centre of the goal. Substitution, Bradford City. Mason Bennett replaces Filipe Morais. Attempt saved. Anthony Grant (Crewe Alexandra) right footed shot from outside the box is saved in the centre of the goal. Attempt missed. Filipe Morais (Bradford City) left footed shot from outside the box is close, but misses to the left. Gary Liddle (Bradford City) wins a free kick in the attacking half. Substitution, Crewe Alexandra. Billy Waters replaces Liam Nolan. Substitution, Bradford City. Oliver McBurnie replaces Aaron McLean. Goal! Bradford City 2, Crewe Alexandra 0. Gary Liddle (Bradford City) right footed shot from outside the box to the top right corner. Assisted by Filipe Morais. Substitution, Crewe Alexandra. Oliver Turton replaces Chris Atkinson. Goal! Bradford City 1, Crewe Alexandra 0. Aaron McLean (Bradford City) right footed shot from the centre of the box to the centre of the goal. Assisted by Mark Yeates. Attempt saved. Aaron McLean (Bradford City) header from the centre of the box is saved in the top centre of the goal. Attempt saved. George Cooper (Crewe Alexandra) left footed shot from the left side of the box is saved in the centre of the goal. Corner, Bradford City. Conceded by Matt Tootle. Corner, Bradford City. Conceded by Chris Atkinson. Delay in match Stephen Darby (Bradford City) because of an injury. Gary Liddle (Bradford City) is shown the yellow card. Febian Brandy (Crewe Alexandra) wins a free kick in the defensive half. Substitution, Bradford City. Billy Knott replaces Jason Kennedy. Attempt saved. George Ray (Crewe Alexandra) header from the centre of the box is saved in the top centre of the goal.